Even though Bubble Tea was invented back in the 1980’s, it only became a hit in Canada in the early 2000’s. This pretty-looking Taiwanese drink is usually made of tea, tapioca pearls and another liquid, like milk or a fruity syrup. 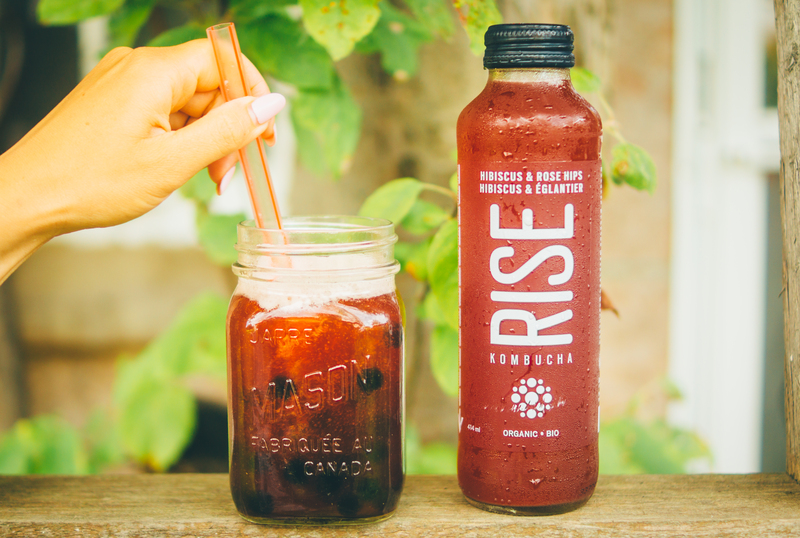 We asked vegan chef Olivia from OliveganFoods to create original recipes for RISE Kombucha fans. Her twist on this Taiwanese classic will make your tastebuds scream of joy, guaranteed! * To make your own syrup, boil equal parts of water and sugar. Rose petals were added in this recipe for a hint of floral fragrance. 1. Boil your tapioca pearls for 25 minutes, and rinse with cold water afterwards to prevent sticking. 2. Grab your RISE Kombucha bottle. For this recipe, the Hibiscus and Rose Hips flavour was mixed with the rose syrup. Rose syrup adds sweetness and lightens the colour of your drink. That way, you can see the contrast with the black pearls. 3. Add the tapioca pearls to your tea, stir in the fun, and enjoy!